Great review. I shall be hitting the I-75 to drive up to Tampa to see this one tomorrow. I think you’ll really enjoy it, Mike. From what i read in other blog, the clogged sink, the Bashkor constipation problem and the water pump at the kolkata house stop functioning all referred to metaphor of not letting go. 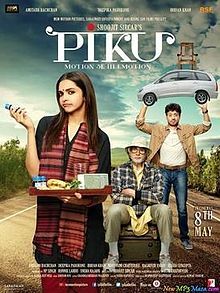 Baskhor didn’t want to separate from piku and piku is stuck with Baskhor . It sound make sense. Believe me, Abdul, there are so many references to constipation in the movie that it is impossible to miss the metaphor. 🙂 Therefore, it didn’t need to be represented visually. Doing so is just a cheap gross-out gag that I found tacky. I’m pretty sure I’m a die hard fan of this Director by now. The writer too. I’m sold on almost anything they do at this point. I’m also surprised as his ability to take material that can easily become cheap, 3rd rate potty humour, but handles it with class. 1st with ‘Vicky Donor’ and sperm banks, and now with ‘Piku’ and conspitation. I’m sold on Sircar’s next film based on the title alone: Agra Ka Daabra. Caught up with Piku the other day ,what a fun movie it was !! 🙂 The part of your review ” Sircar shoots most of the film’s conversations so that all the actors’ faces are within the frame, simultaneously…………” completely agree with you.It made me feel as if the entire thing was happening right in my living room.Wonderful performances from the cast & what a stellar combination the writer/director are turning out to be !! Also,I found the maid scene pretty funny too.Here’s a video i am sharing below,a fun take on maids in Urban India(subtitled in english). Do watch if you got few minutes. Thanks, Nicky! I like the video, too. The maid’s “Middle Class Package” and “North Indian Diva Package” — too funny! This thing is so funny, shrey. Hmm I don’t see Irfan Khan or any reference to him in the video; What am I missing? I fixed the link, Amin. Thanks for catching that.